he ultrabook segment attracts more and more attention with products with thinner size, huge technical potential and last but not least – more affordable prices. The latest proof is the new ultra slim product by HP. So, we are pleased to present the HP Spectre XT Pro Ultrabook. We don’t usually do it, but In that case we’ll use just one word to describe the device – unique. And why is that? The built in memory is mSATA Solid State Drive with 128 GB. First of all because of its appearance – aluminium body with matte finish, thin profile angled towards the front and strong opening mechanism. And to help you get a visual idea of how compact this 1390 grams ultrabook really is – here are its dimentions – 316.5 mm width, depth of 224.5 mm and a thickness of 14.5 mm in the most thickest part. The XP Pro is leaned forward and has some extra space beneath, which is a great design trick combined with functionality. It makes typing much more comfortable because of the position your wrists get into. It also opens a little extra space for cooling. In the Hp Spectre XT Pro, this happens in two ways – through the opening on the bottom and through its aluminum construction which is a good conductor of heat. The display chosen for this model is a 13.3-inch LED BrightView. Its HD with a resolution of 1366 x 768 pixels. The picture is clear with vivid colors. And since the ultrabook is a device created to be carried around and used outdoors HP have taken care of the direct sunlight problem and the visibility of the display remains clear enough. The angle of side vision is wide enough as well. The display has a glossy black casing, and centrally located in the upper part is the HP TrueVision HD Web cam and stereo microphone. The display has a glossy black casing, and centrally located in the upper part is the HP TrueVision HD Web cam and stereo microphone. An important thing that you’ll notice on the surface of this ultrabook is the little red letter B, which is a sign for strong and crystal clear sound as it’s the branding for Beats Audio – the famous sound system by Dr.Dre. There are two stereo speakers located on the two opposite bottom corners which we found curious because usually in other machines we are used to see them above the keyboard. But there’s an explanation – as we mentioned before this ultrabook has some extra space beneath it and when it comes to the sound, it plays the role of a resonator, which gives the volume a boost. At the periphery of the HP Spectre XT Pro we find a lot of ports for an ultrabook that thin. There are two USB ports – one of them Is 2.0 and you can use it to charge a device even if the ultrabook is turned off. The other one is the faster 3.0 version. 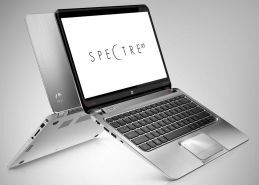 The processor of the HP Spectre XT is the dual-core Intel Core i5 with model abbreviation 3317U. There’s also an HDMI port, and the wireless connection is via Bluetooth 4.0 and a Wi-Fi standard 802.11. Considering the size of the XT Pro, there is no optical device, but a 2-in-1 Digital Media card reader is available. The processor of the HP Spectre XT is the dual-core Intel Core i5 with model abbreviation 3317U. It has 3 MB L3 cache and each core is running at 1.7 GHz and at 2.3 GHz with the Turbo Boost Technology. SDRAM memory is 4 GB DDR3L at 1600 MHz. The built in memory is mSATA Solid State Drive with 128 GB. The video card -the new generation – Intel ® HD Graphics 4000. And although the ultrabooks main function is not gaming you could run games like Battlefield 3 or Fifa 12 without any trouble. This ultrabook showed no lagging during our testing. And another interesting fact – the device boots up for about 6 seconds. The battery, powering the HP Spectre XT Pro is a 4-cell Li-Ion with a charge of 45 WHr, making to ultrabook able to operate for about 8 hours of active use per charge.